We're almost at the end of yet another year so here is a cute Christmassy slideshow I found whilst digging through the AtariMania archives. It's from a disk magazine by Effect and is stuffed full of text and even features the most annoying rendition of "The 12 Days of Christmas" I've ever heard - but at least it supports the STe audio!! I would also like to take this opportunity to thank everyone for their help and ST commitment over the past year. Once again, I've met some great people and seen things which I thought would never happen after the ST "died" in the mid-90s. There are so many awesome games and demos recently released but my personal favourite is, of course, Manic Miner which is a fantastic remake of Matthew Smith's ZX Spectrum classic from 1983. Absolutely brilliant. 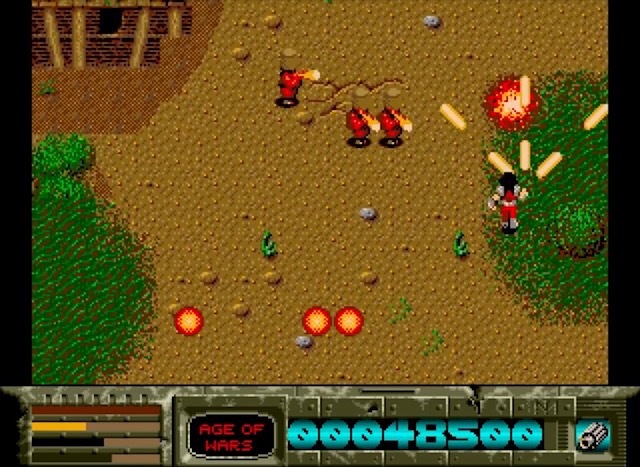 The conversion of Time Soldiers was released in 1989 by Electrocoin and is based on the vertically shoot 'em up which isn't too dissimilar to something like Ikari Warriors. The story goes that big bad Gylend has captured a few of our friends, who are now held captive in different time periods, so it's up to us to find and rescue each one. 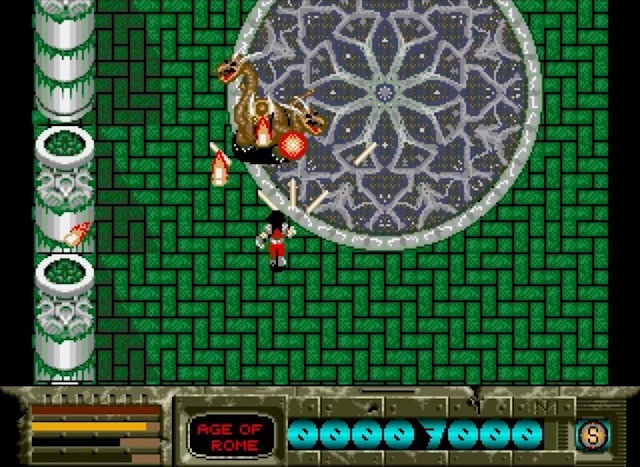 Age of Rome is the first level which introduces us to the chaos but it soon gets a lot harder! 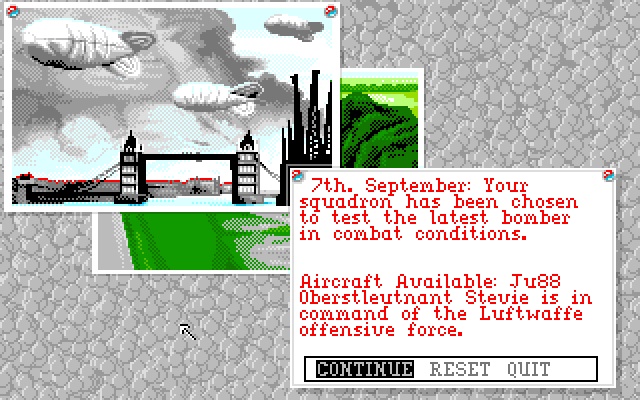 Each one of the time periods has a change of graphics but is basically the same format. These places are stuffed full of enemies that need killing and slain baddies leave behind goodies which should be collected - otherwise, your sucky weapon is near useless. Health can also be replenished which is always needed as every contact drains you dry. There's usually a lame boss monster looking for a fight but most are rather easy. Weirdly, my power-ups ran out during the big boss fights which made it nigh on impossible to win - unless you're cheating like me! 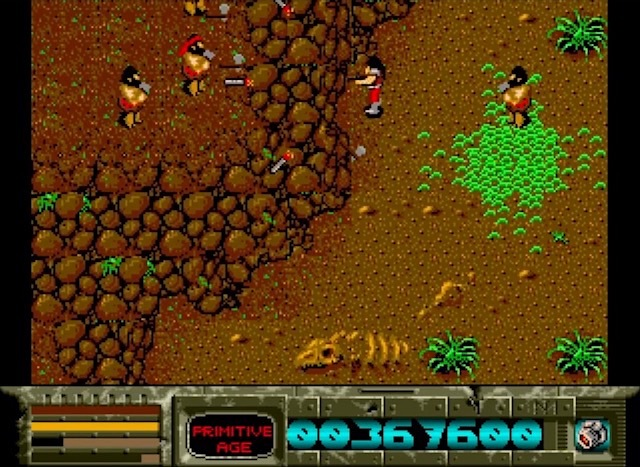 Having never played the original means I'm in the dark a little but I've watched videos and this doesn't feel like the same game. 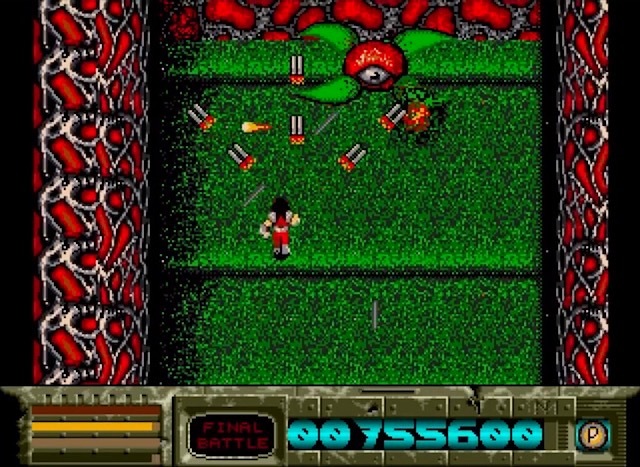 It's more a cross between something like Wanted or Commando yet doesn't impress nearly as much because it's pretty slow and the scrolling will pause unless you remain close to the top of the screen - which only leaves you vulnerable to any off-screen baddies! 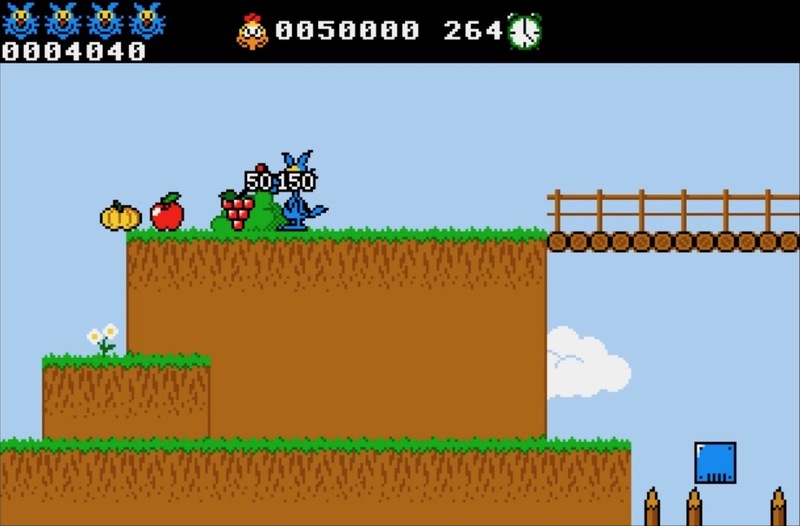 Sadly, it's too darn difficult having only one life and there are no arcade-style continues which means I rarely got past the second level and I wonder who beta tested this! 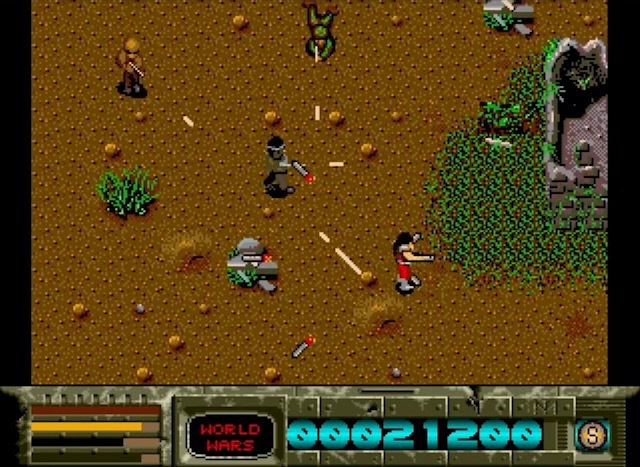 I quite like the graphics in Time Soldier, sprites are nicely detailed and they usually attack in waves so expect the screen cluttered with enemy fire - which I love. Heck, it's even making use of overscan and the scrolling is pretty smooth. 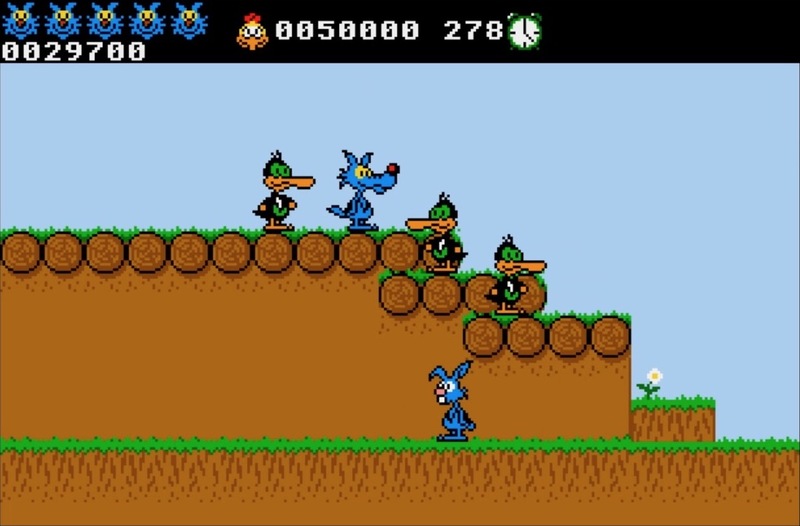 The background music is balanced well against the sound effects and suits the gameplay very well. I've enjoyed Time Soldier but I have mixed feelings: what I didn't like is the scrolling method which doesn't work well but only having one life is the real killer and the reason why I cheated for my longplay recording!! If you're expecting an authentic arcade conversion then brace yourself for disappointment. 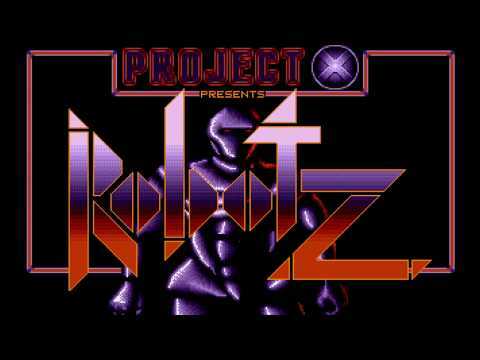 However, in its own right, this is a rather good shoot 'em up with progressively interesting levels that offer lots of action. #TooToughWithoutCheating! If there are any time cops out there then grab either the floppy or hard disk games and good luck. 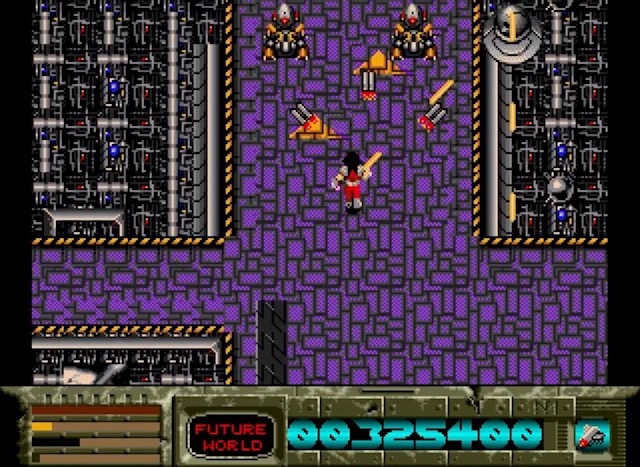 Future World is pretty weird stuff and the Final Battle is oddly quite short. Great ending though...! 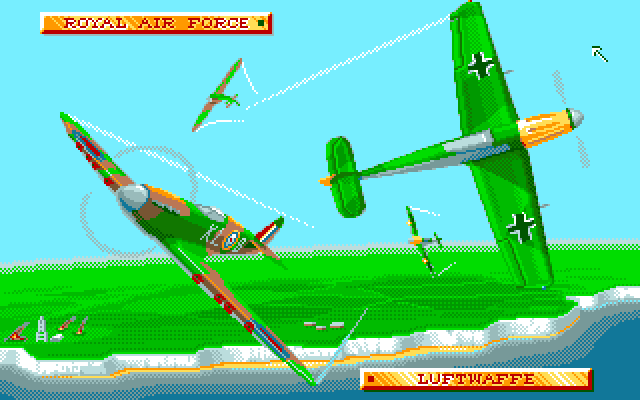 Reach For The Skies was released back in 1993 and attempts a recreation of the Battle Of Britain era between the Royal Air Force and the German Luftwaffe. It's obviously a crucial part of the entire war and the battle is split into four mammoth sections. 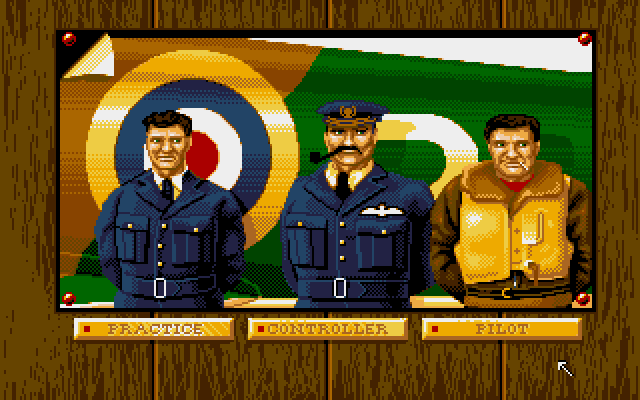 If you're up to the task, you can be either a pilot or the controller for an entire squadron. Awesome pixel art albeit with some freaky faces. The middle pic features Colonel Von Strohm? Those that prefer to take things seriously are adviced to learn the cockpit and keep the keycard sheet at hand. As you get accustomed to flying the skies, you will note some great external views: I really enjoyed these and you can watch me messing about on my YT channel. 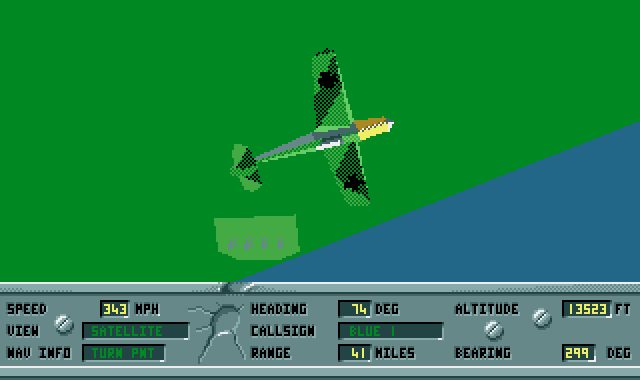 There are other awesome features like video recording and even the ability to flip between each member of your squadron. Yup, this is a big game that will take time to master. 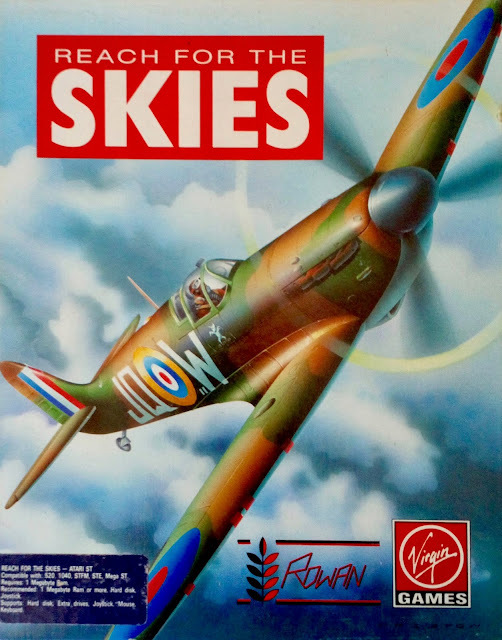 Overall, this is a demanding flight sim with some neat features that help a novice, like me, get the most from the very start. I love the authentic cockpits, and the external views are stunning, but learning to hunt down and destroy the enemy will take much practice. But that's definitely a good thing, right? 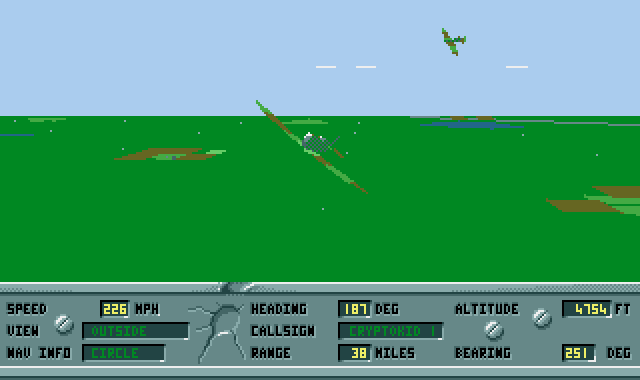 Reach For The Skies is one of the best flight sims I own and something I will enjoy time and time again. Tally-ho and chocks away, old bean!! 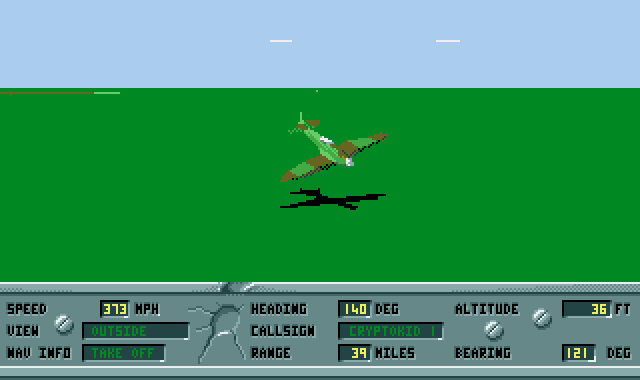 Whatever plane you decide to pilot, make sure you run this from a hard drive if you can (floppies on Stonish). The 3D is good and the various camera angles are really impressive for some cool screenshots! 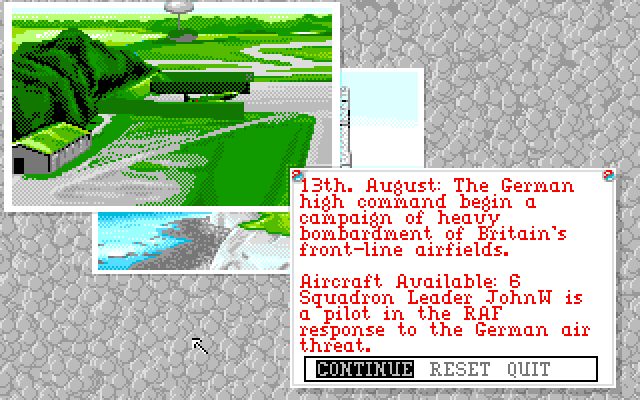 Please note: the video recording is based on my own experience using a Mega STe (16MHz) and I've tried to show the game's basic features for both the German and the British sides. Perhaps I should have used the standard computer, but there are lots of other videos out there so I fancied putting those extra clicks to use for a smoother experience. However, it's worth noting the old ST does perform exceedingly well (no change there then!). Let me start by saying that I never play "mobile" games. However, I was in my car bored stupid (it didn't take very long) and I remembered that Eckhard Kruse's Ballerburg has been remade by a company called DonkeyCat. 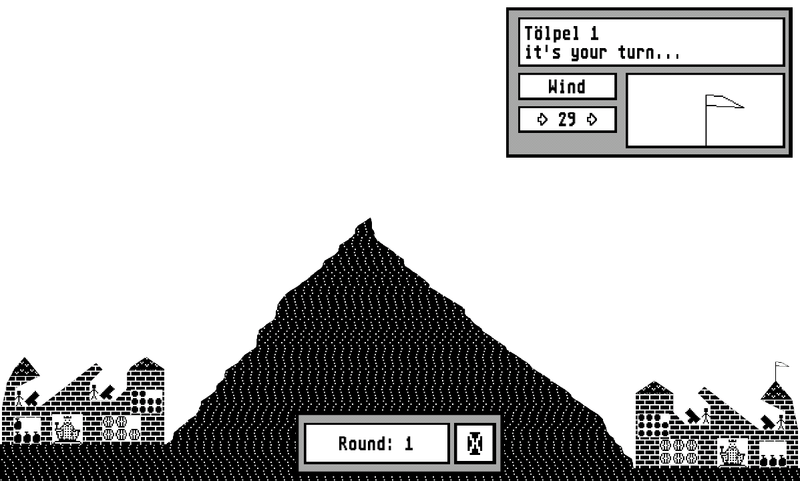 Well, to say I'm blown away is an understatement because this classic mono game looks and feels very authentic and is pretty much like having an ST in your pocket. Gameplay is just as you would expect with wind, angle and speed to decipher so chose your kingdom and get blasting cannons over the mountains. Jolly good fun! 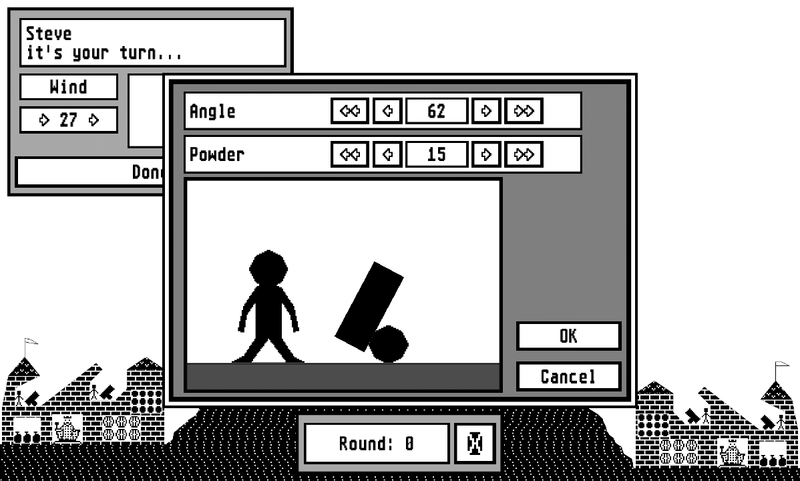 Okay, I still prefer the ST original but get on the App Store and grab yourself some of this mobile artillery action. Atari Legend is having a fantastic run-up to Christmas by releasing something special every day throughout December. 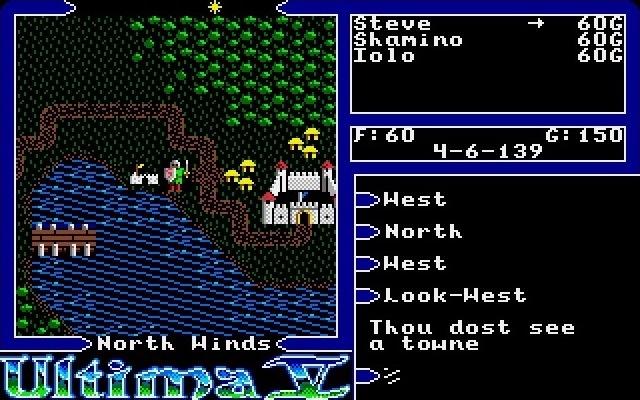 It wasn't until the 7th when they released a hdd-patched version of Ultima 5 did I become interested. 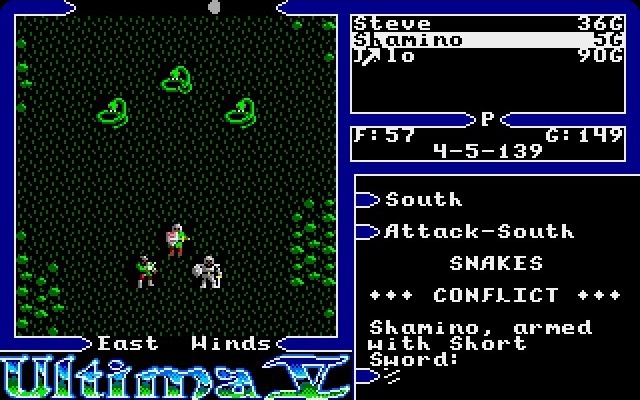 For some reason, I've not played any Ultima but this one looks especially interesting so I had to try it! The land of Britannia has lost its king, Lord British (lol) and is now ruled by a tyrant called Blackthorn. 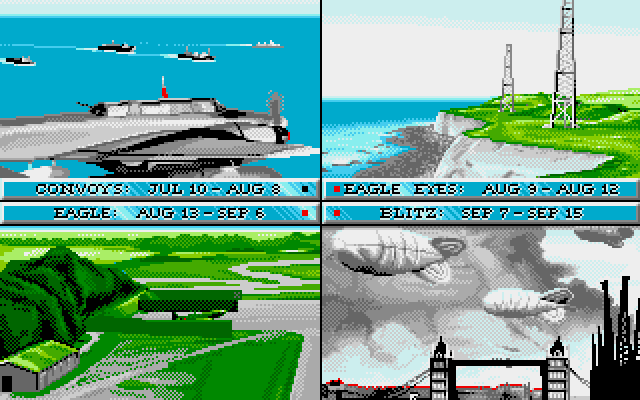 Okay, it all sounds rather corny and the visuals might not rock the Bitmap Bros off top spot - but when did great graphics ever matter to the gameplay? I mean, just look at Rogue which I found to be a breathtaking experience. Nuff said. Looks like I'm in a pretty cosy place but let's get out and explore the lush countryside. Oh no, a two-headed Ettin has found me when walking over the hills. I should have run away! Creating yourself a character is an usual affair and something I didn't expect but this process got little Stevie configured and straight into the thick of it. Boy, are there a large number of keys to learn for each and every action and interaction within your surroundings. This place is huge and the battles are very hard so exploring Britannia is going to be lots of fun (or agony?). But I can take it!! I've genuinely enjoyed my first couple of games: a lovely country walk through grasslands and forests until I came upon a small bridge - with a Troll. Luckily I made it across without him noticing me but I then ran into some red demons who decided that they wanted a piece of us. Yep, my first battle didn't go down well if I'm honest... Hang on, I think I've been resurrected for another bash! Vicious snakes decide to spit venom at our plucky adventurers. A bad mistake! 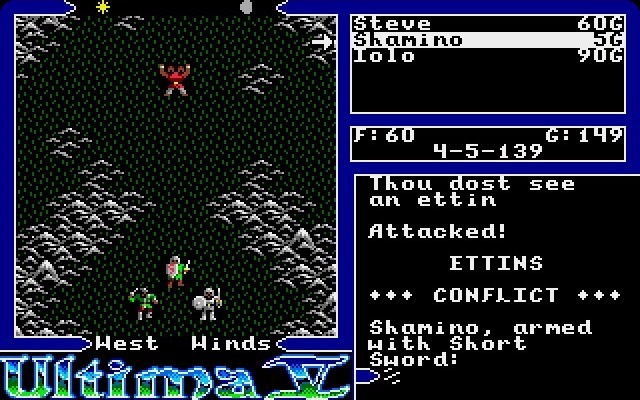 Now I feel Ultima V is finally starting to open up to this old noob. What a game! 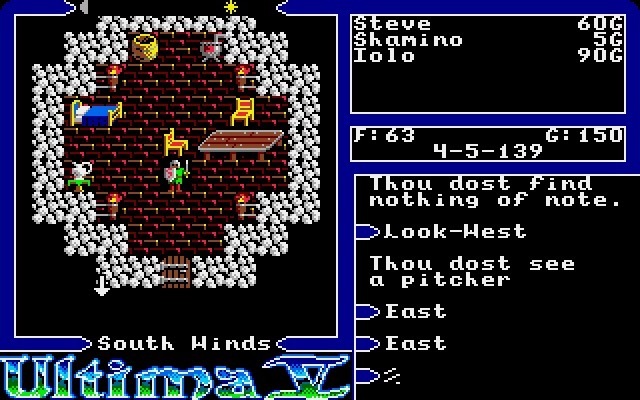 I plan on spending the Christmas holidays playing Ultima V - with whiskey, turkey butties and mince pies beside my keyboard of course! 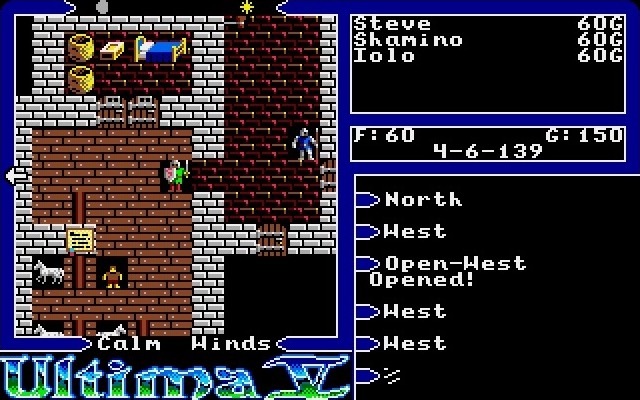 I'm really looking forward to learning more about Ultima V and have (so far) had a brilliant few games. I'm excited but now time to takes things seriously and see how this adventure plays out. My thanks to everyone over at Atari Legend for these daily treats!! Keep up the great work and STay Atari. MandelST is a new fractal generator developed in GFA Basic by Manos Kantzos (thanks to GeoAnas for the heads-up). I love messing about with funky fractals and this program is a cinch to use - which is a good thing for me! 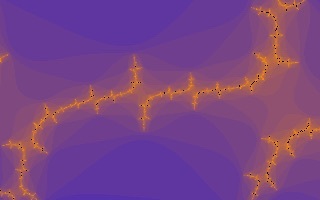 Mandelbrot/Julia productions can be generated within moments but faster computers will certainly benefit from their extra grunt. Of course, emulators are a good idea unless you prefer to leave your ST on overnight! Images can be export as Degas PI1 or TIFF, which I think is extremely cool. Also, basic animations are possible which will take us deep into our freaky infinite mathematical world - what an absolutely stunning idea with great potential. I've been having a play over the weekend and created some peculiar images and a nice animation I'm quite proud of. 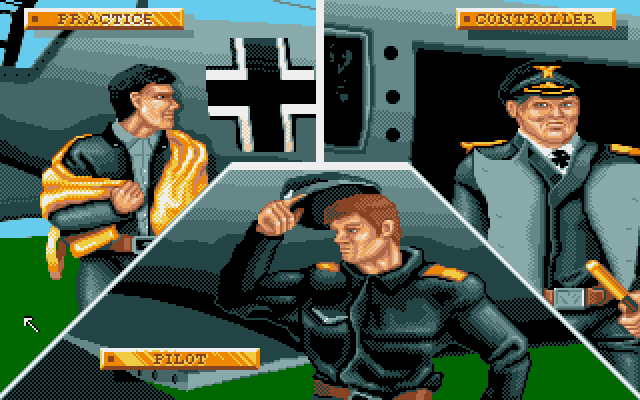 MandelST is a great program and it's superb to see something new coming out for the Atari ST so I'm hoping Manos continues to develop and improve upon it. Have yourself some geeky fun zooming in on infinite. I have!! 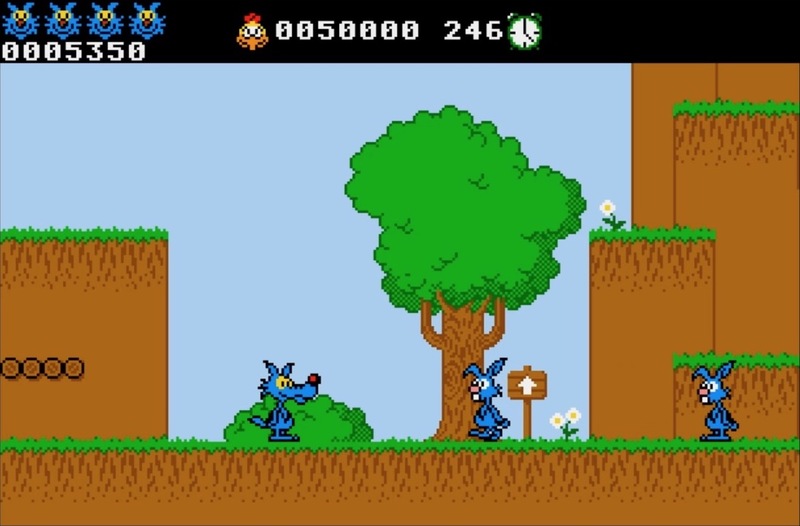 Lupo Alberto looks and sounds great but that push scrolling lets it down, especially when killed by something off-screen! 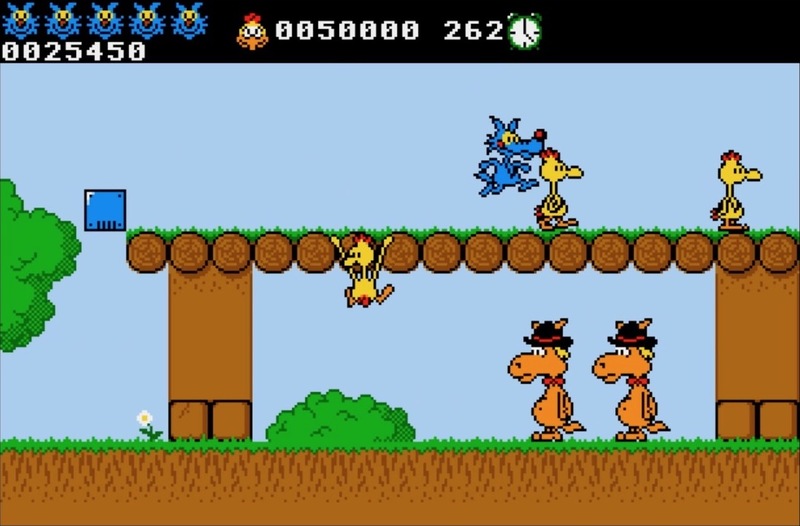 But it's still good fun and the two-player co-op is a fantastic feature as is being able to change character. 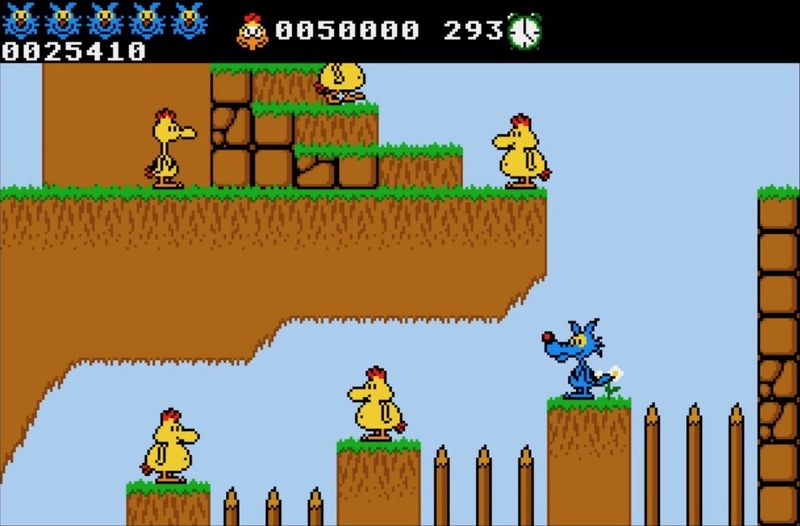 Overall, it's a shame that this was never released because I enjoy playing it. Well, until I got stuck!